Love it or hate it, the crisp, cold Japanese winter has arrived and it’s time to switch your air conditioners for radiators and your sunglasses for gloves. But what about in the food department? A few yakitori sticks and sushi rolls, as good as they may be, will not be enough to warm your belly and satisfy your need for a piping hot dish in this cold season. What will, though, are delectable nabe dishes. Sumo wrestlers obsessively eat nabe when they train to gain strength, so if it’s good enough for them, it’s good enough for you. Nabemono dishes (nabe meaning pot and mono meaning things) are very popular in Japan. They mostly consist of clay pots filled with stews and soups which you add ingredients to as you go, cooking at the table. Nabe is very versatile and there are different types to choose from, such as chankonabe, motsunabe, oden, shabu-shabu, sukiyaki, yosenabe and yudofu. Chankonabe is specifically given to sumo wrestlers due to its filling qualities, larger portions and the variety of ingredients used. It usually features many protein sources such as meatballs, chicken, fried fish balls and chunky skin-on chicken pieces. It can be served with beer and rice to increase the calorie intake. You can find comforting good quality chankonabe at Tamakairiki, located in Ginza or Hiroo and owned by a former sumo wrestler by the same name. Here you will find that the chankonabe has a thick, rich broth to cook the ingredients in from the burner placed at the table. You can sit from counter seats, table seats or tatami seats. Shabu-shabu contains thin slices of raw fatty meat (usually beef, specifically rib-eye) and vegetables immersed in boiling water. In fact, the term is onomatopoeic, as “shabu-shabu” refers to the sound made when you swish the meat in the water back and forth. 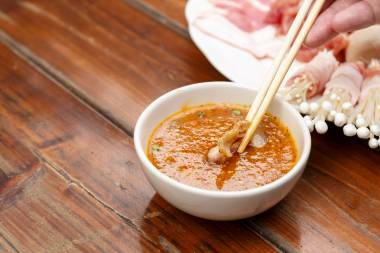 It may be a simple dish but it’s definitely flavorsome due to the fat of the meat and the accompanying dipping sauce. The trick is to not overcook the beef. Seryna in Roppongi, Ginza and Shinjuku is famed for its kobe beef shabu-shabu. Not only do they use the best quality beef full of delectable marbling, but they also have a range of premium dipping sauces which include sesame, ponzu, a spicy sauce and a salt one. The price tag is hefty, but most diners are willing to pay for the texture of the melt-in-your-mouth beef alone. If your pockets aren’t too deep, however, Momo Paradise (a popular franchise situated all over Shinjuku) will have you covered with their 90 minute all-you-can-eat shabu-shabu. You’ll have a selection of the signature paper-thin beef option but also pork, chicken or seafood—and of course plenty of vegetables. Noodles and rice will be plated separately should you wish for them. Like shabu-shabu, sukiyaki is also primarily cooked with very thin raw beef slices, vegetables, and served with a dipping sauce, but this is where the similarity ends. Sukiyaki is not boiled in water, but slowly simmered or skilletted, offering a richer flavour. Different regions have different ways of preparing sukiyaki. Eastern Japan prefers to boil the broth before adding the meat and vegetables to simmer together. Western Japan cooks the meat first and then lets it swim in the sake and sugar mix, with the vegetables added last. Raw eggs are the dipping sauce of choice with sukiyaki. One contender for your go-to sukiyaki Tokyo joint should be Yamato, located in Ningyocho. You’ll find a completely affordable set lunch menu dishing out the best of the best of sukiyaki. Once you use your chopsticks to dip the premium succulent beef in the fresh raw egg yolk, you’ll want to go again and again. As for vegetarians or tofu lovers, there is a nabe just for you to ensure you aren’t missing out: yudofu. 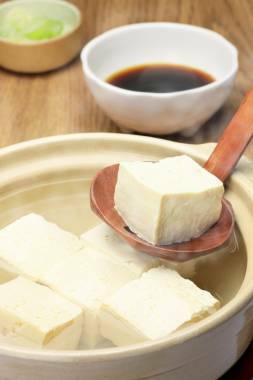 Chunks of tofu are simmered in hot water with vegetables and eaten with condiments like ponzu and yuzu kosho. We say water, but usually the hot water is partnered with dried kelp to add some extra flavour. Mentsuyu or ponzu is used as a dipping sauce. For yudofu, I recommend Ume no Hana Ginza Namikidori. Ume no Hana takes fine dining tofu very seriously by serving more than ten types of tofu dishes. The yudofu here is simple yet sticks to the ribs. It features parcels of tofu boiled in a mild clear soup which is then dipped into a soy-based sauce. What’s not to love? We believe it has the power to convert anyone who isn’t a fan of tofu. You can find several restaurants all over Tokyo.